Water and salt: Can they heal? Over one third of Americans have tried a form of alternative medicine, spending billions of dollars out of pocket. As mental health and chronic conditions crescendo, some doctors prescribe alternative medicine as a response to conditions ranging from allergies to addiction recovery, replacing pills with less-traditional approaches like acupuncture for pain relief. Yes, there are skeptics, but it’s safe to say these therapies are not just hype. Most originate from age-old practices of calming the mind and spirit. Newer to Buffalo include flotation and halo therapy, where individuals experience mental and physical relief from simple things like water and salt. “Throughout the day, there are so many distractions,” says Joe Fambo, owner of Flo in Allentown. Flotation therapies involve large tanks. For $55, clients float for 60 minutes in 16 inches of water, heated to 95°F (body temperature). The air within the tank is also 95°F. This decreases your sensory intake and helps achieve total relaxation. The float tank at Silver Essence Floating Spa promotes total muscle relaxation. It also offers an infrared sauna. In the tank, there is zero pressure — and your spine can expand up to an inch. Other physical benefits include improvement of arthritis and gout. Sciatica patients, pregnant women and even professional athletes book float sessions to feel their muscles decompress from floating. 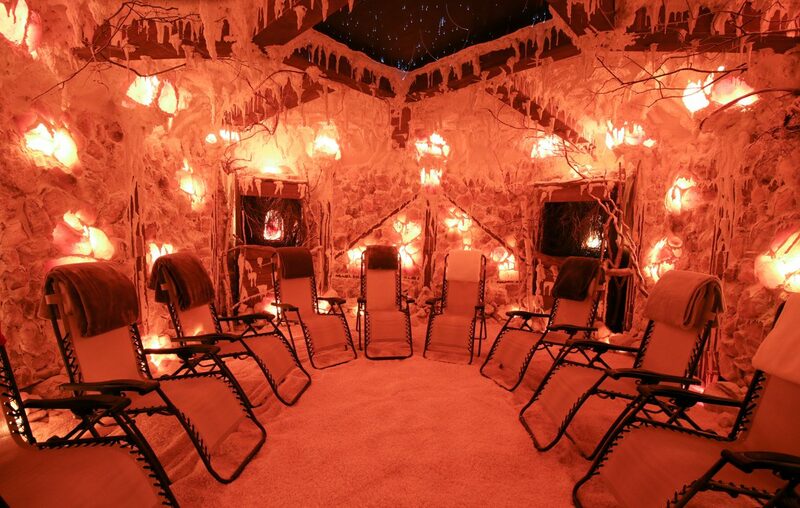 Clients of salt caves can relate, surprised by the whole body healing effects of 20,000 pounds of Polish salt infused through halo-generators — machines that breathe salt into the room. “It mimics the climate of salt mines,” says Pam Toole, owner of Southtown Salt Cave & Spa, home of the airtight, wall-to-wall covered salt room. Step inside, and your foot is buried in six inches of salt. Ten lounge chairs are available; no phones allowed. For $40, clients relax and rejuvenate in the 65-degree room, breathing in the salty air for 45 minutes. You can smell and taste the ocean. “It’s like a roller pad cleaning your lungs,” says Toole. Salts are antibacterial and antifungal. It’s one reason people feel happy at the beach. Studies prove negative salt ions are inversely related to your levels of serotonin in the brain. This everyday mineral has even more benefits: Salt caves can bring respiratory (COPD, ear, sinus and asthma), skin (psoriasis, eczema) and mental (stress) relief. Toole even offers children’s, Tibetan bowl (sound therapy) and restorative yoga sessions to encourage deep breathing practice in the cave. “It lends itself to calming and introspection,” says Rachna Clerici, restorative yoga teacher. Students enjoy sinus clearing and open airwaves through breath awareness — a skill taught by Clerici, and a perfect complement to anyone’s health routine. “Life is all about these ‘aha’ moments,” says Fambo. Think of them as tools leading to openness, ways to live your best life by seizing more nirvana moments. Finding them is the adventure. You’ll just have to breathe in the salty stillness, and float your way there.